Summer fun is almost over--vacation is through, sunshine is waning each day and the temps are dropping little by little. Lazy, hazy days of summer are fast becoming a memory and it's time to get back into routines. Time to get back to blogging schedule! Let's start with some fun for Throwback Thursday. Here's a little number I created a few years ago. I had wanted to give ATCs (Artist Trading Card) a try and had a ball. While I wouldn't want to do these all the time, ATCs would be fun little things to add to a card front or a scrapbook page. 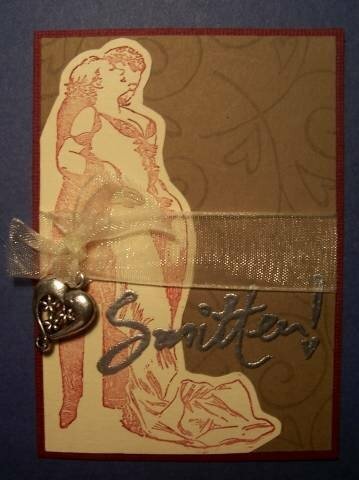 This particular ATC features a loving vintage couple. I'm sorry, but do not remember where I purchased it from. :( The phrase is a Stampin' Up! stamp, as is the background stamp. Ink used was Bravo Burgandy for the image, versamark for the background and the phrase. Silver embossing powder was used on the phrase. (I still need serious help embossing, ugh). Thankfully I'm better at "fussy cutting" than embosssing, lol. The ribbon and charm were some that I had on hand. Perhaps when things settle down again I'll be able to make some time to practice embossing.